Chadwick Boseman has been enjoying a little time off the scene but the actor was back on the red carpet yesterday evening(July 18th) for the 2018 ESPY Awards at the Microsoft Theater in LA. 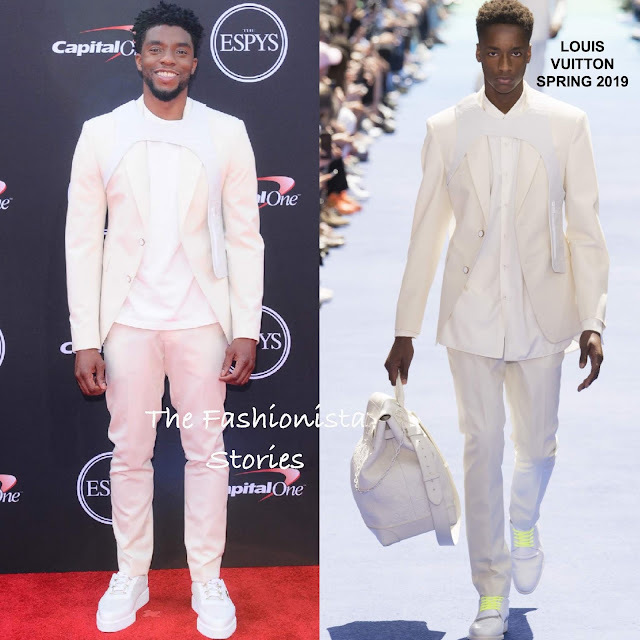 On hand as a presenter, the 'Black Panther' king rocked head to toe LOUIS VUITTON SPRING 2019 featuring a white suit which was adorned with a harness and white platform sneakers. Chad is the first male celeb to wear Virgil Abloh's debut LV collection on the red carpet. Seeing as he was front row at the show, it is no surprise. CB ditched the white button down shirt from the runway look for a simple white t-shirt which worked with his suit. However that harness looks a tad silly but I like how he takes chances. This suit was perfect for him and his look was topped off with DAVID YURMAN jewelry and his signature twists. Are you sold on CB's all white look?